Bite flaws like misaligned, crowded, gapped or crooked teeth can leave you with malocclusion (improper bite) and a less pleasing appearance. With Invisalign aligners, though, you have a way to make the necessary improvements in a discreet manner. Your dentist says that while correcting the alignment of your teeth, don’t forget about your oral health. Thus, take a moment to learn how to properly care for your aligners. The Invisalign method for correcting your bite utilizes a series a clear, plastic aligners to gently and gradually correct your bite. The process starts with your dentist taking pictures of the current state of your teeth and developing a treatment plan using state-of-the-art 3D computer imaging. The data is then sent to an Invisalign lab that will fabricate a full set of aligners. You’ll wear each pair for two weeks and then discard them for the next set in the series. Unlike the traditional braces process, you won’t have to visit for adjustments. Instead, you’ll stop in every six weeks so your dentist can monitor your progress. Throughout the Invisalign process, the look of your smile is not the only concern you should have. The health of your teeth should remain at the forefront. Thus, it’s important to care for your aligners properly to prevent bacteria growth that could lead to cavities, gum disease and other serious issues. Furthermore, sufficient upkeep will ensure your aligners aren’t damaged. 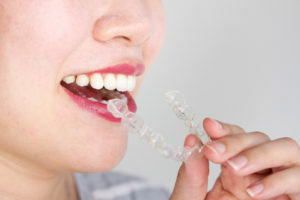 Clean the Aligners Regularly – Whenever you take out your plastic trays, be sure to rinse them thoroughly to remove the saliva before it dries, which helps to prevent bacteria growth. Store Them Properly – To prevent damage, store your aligners in their correct containers when you remove them. Also, avoid leaving them in hot environments (can cause them to warp) or areas where they can be reached by children or pets. Don’t Chew While Wearing Them – Invisalign aligners are designed to be removed while you eat, not just as a convenience, but also as a necessity to prevent damage. Soak Them Properly – When you remove your aligners and rinse them, be sure to next soak them in a solution designed for them. Two options are to use denture cleaner or Invisalign cleaning crystals. A final way to care for your Invisalign aligners is to keep your teeth as clean as possible. Because the plastic trays fit so closely to your teeth, any lingering food particles or bacteria will easily be transferred to the Invisalign trays. Therefore, when you remove them, be sure to brush and floss your teeth to keep them healthy. Thus, when your treatment is completed, you’ll have the smile of your dreams without sacrificing your oral wellness. To learn more about the Invisalign process and how to get on the road to smile perfection, reach out to your dentist to schedule a visit today! Dr. Drew Vanderbrook earned his dental degree from Baylor College of Dentistry. He has since maintained affiliation with the prestigious Spear Center for Dental Excellence, where he has received advanced training in different modalities. Dr. Vanderbrook helps patients enjoy healthier and more pleasing smiles with Invisalign at Vanderbrook Family Dentistry, and he can be reached for more information through his website.